In the year 2011, Belarusian government has approved the legislative program “IT Country” to promote outsourcing, information and communication industries in Belarus for the years 2011 – 2015. The program has originally been conceptualized in 2007 by the director of BelHard Group Igor Mamonenko. Now supported by the government as well as many outsourcing industry executives, the program’s objective is to establish the modern IT and IT-enabled services industry in Belarus by 2015, educating 300,000 software developers and BPO professionals. To achieve this goal, it is planned to retrain country’s numerous accounting and legal professionals into IT engineers and operators of so-called IT-enabled services industry which includes data entry, call center and technical support services. According to Belarus Statistics Agency, there are 400,000 accountants in Belarus compared to China’s 155,000. Igor Mamonenko suggests to promote attractiveness of IT education to the accountants and introduce short term IT courses for those interested to retrain, following international best practices adopted to the local market needs. Does the program offer a realistic solution to the problem of skill shortage? GoalEurope investigates. IT salaries in Belarus are both attractive for anyone to choose IT profession and low enough for Belarus to remain competitive in global software development outsourcing marketplace. Let us compare average monthly salary in Belarus with that of a software developer. After the devaluation and the rise of the dollar against the local currency, according to the National Statistics Committee of Belarus, the average monthly net salary in Belarus amounted to 330 US dollars. IT specialists earn significantly more according to dev.by and mojazarplata.by (local online salary survey websites). An average monthly net salary of a software developer exceeds 1,200 US dollars. Android and iPhone developers have recently become so popular that an average monthly salary can reach 2,000 US dollars and more. Statistically, next in demand are Java developers which earn nearly 1,800 US dollars per month after two to three years on the job. Beginners can get 500 US dollars net per month whilst senior developers with 6 years of experience bring home 2,300 US dollars. Not far behind are the salaries of experienced .Net and PHP developers. The ones with two to three years working experience earn 1,700 US dollars net a month. This compares favorably with Romania where a software developer of a similar level of experience earns 2,300 US dollars net per month. To arrive to a total cost of employment, a company must add 34 per cent on top of the gross salary for social security contribution. A personal income tax in Belarus is 12 per cent and the deductions to the retirement fund is 1 per cent. 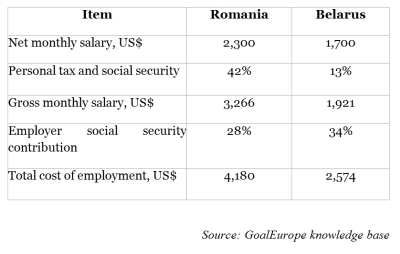 To see whether outsourcing companies in Belarus have a distinct cost advantage, let us compare the total cost of employment in Belarus and Romania. Based on the table below, Belarus is clearly a winner as its labor cost is 74% lower. The low labor costs allow Belarusian software development companies to compete effectively on the global outsourcing marketplace. Yet at home, they have to compete with each other to hire the best software developers to satisfy growing demand for IT resources. This competition for IT professionals in Belarus is getting stronger every year. IT specialists with two to three years of experience typically receive 4 to 5 job offers and can choose their employer based not only on salary but also on other conditions: projects, the existence of a social package and the proximity of the office from home. “The growth of our company is constrained by the situation on the labor market. Such fact that we have ‘overheated’ industry does not benefit anyone. Neither the companies nor our customers,” said Dmitry Dolgorukov, deputy director of Itransition. Besides the market overheating, there is another trend which is migration. Talented and hardworking specialists move to the USA, Canada, EU, Ukraine, Russia or even Australia and this also affects the labor market. There are certain number of people who return but it is not high. Both trends emphasize importance for a larger supply of IT specialists so that outsourcing industry in Belarus can continue to provide its services at an attractive price. Some software development companies organize regular IT courses where preselected students obtain the necessary skills and undergo extensive training before participating in real software development projects. Smaller companies which cannot afford organizing regular courses conduct short term training seminars instead and hire the best students based on their performance. Graduates from other scientific disciplines also have an opportunity to be trained as an IT specialist. There are several short term courses in Belarus for a profession of web designer, testing engineer, Java developer, PHP developer or a business analyst. These courses last on average of two to three months. Upon completing such courses, newly trained IT professionals look for a job which is not easy to find without relevant prior work experience. This year, universities increased the number of seats for those entrants who wanted to study software engineering. The government supports creation of IT centers throughout the country to encourage IT professionals, managers, employed by HTP resident companies to continue their post graduate education in engineering and computer science. Another objective is to contribute to further education of the teaching staff of the technical universities. Will “IT Country” Program Succeed? During the TV debate about IT Country project moderated by Yuri Zisser on Tut.tv in March 2011 (available here in Russian), Arkadiy Dobkin, CEO of EPAM confirmed readiness to hire newly retrained specialists provided they pass relevant IT tests and examinations. However, he questioned whether or not such retraining program will yield a significant number of capable and talented software developers. According to the director of HTP Valery Tzepkalo, the maximum number of IT specialists in Belarus can not exceed 100,000 based on an example of highly educated population of Sweden. “There is a limit to personal capacity to be a software developer: some simply are not born to do it,” he said during the debate. However, no matter what the ultimate result will be, there was a uniformed agreement amongst the participants which also included Igor Mamonenko and Vladimir Basko that the program will be beneficial for Belarus’ outsourcing industry. Considering the time which is necessary to make decisions on national level and train new IT teachers, the program will yield visible results after six or seven years. 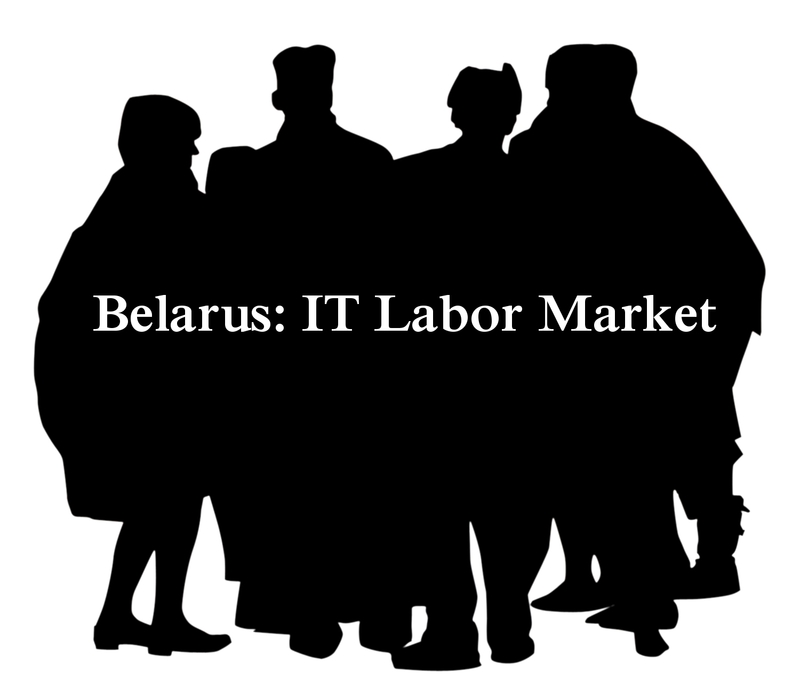 Before that time Belarus outsourcing industry will continue to be short of the IT workforce. To maintain attractive prices on the global outsourcing marketplace, the software development companies in Belarus will be forced to seek new ways to attract and keep employees in addition to offering them higher salaries.